Is it time to start composting or will you be simply taking out the trash again? The analogy between the garbage in our head and the waste we put out to the side of the road once a week has some interesting similarities. The matter that has served its purpose and we no longer have a use for, such as plastic and styrofoam are thrown away in a garbage bin until the Transfer Station truck comes along and takes it away. Some of the other waste such as food scraps and tea bags we throw in a composter until it breaks down into another substance that we can actually use again. The way our mind works most of the time resembles what we do with our trash, we throw our thoughts into a container (our Ego) and periodically we try to clean it out. The problem is we don’t dispose of our thoughts, more often than not we just transfer them to another area of our mind, they don’t dissolve or disappear, they have just simply been moved to another part of our thinking. Nothing ever happens to the trash we put out, it just sits and sits for years and years, our thoughts do the same, nothing changes, the stuff in our head is still there festering over time. Composting, on the other hand, has many benefits and is much more logical and practical. 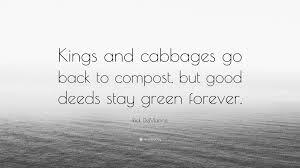 Rather than just disposing of what we no longer have a use for and placing it somewhere else (out of sight out of mind), composting transforms the waste into something useful and worthwhile. Spiritually speaking, taking some of our wasteful thoughts from our Ego and breaking them down so as to make use of them in a more untroubled and functional way helps not only our Self but the collective as a whole as well. When we put our trash out, we actually don’t get rid of it, we just send it off to sit and suppurate in another location. The garbage in our head does the same, our thoughts sit for years all the while increasing in negative intensity, we may try ways to shift our perceptions from time to time but if the problem is never resolved completely, the garbage in our head stays the same, it never breaks down and dissolves. So what do you want to do from now on, take the trash out and forget about where it is going to end up, or would you like to start composting and turning your thoughts into something more useful and beneficial?